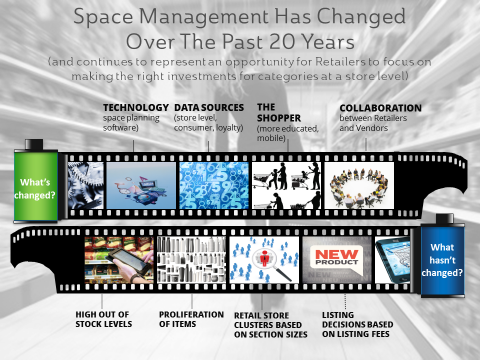 Space Management has changed significantly over the past 20 years, but in many ways has stayed the same. What’s changed? Technology has improved significantly in space planning software. Data sources have become more plentiful, including store-level data, consumer data, and most recently, Shopper research data. More items stocked, without improved sales productivity. Limited means to create space plans that optimally balance inventory, assortment and presentation requirements. Listing decisions based on listing fees vs strategic assortment and shelving choices. Stores treated the same, with store clusters based on section sizes in stores vs Shoppers that shop within the stores. Planograms (POGs) used as means to fit as many of their brand SKUs as possible on the shelf without consideration for Retailer strategy. Increased number of POG requests from Retailers (usually highly tactical requests). Planogramming seen as a tactical & administrative expense as part of the Category Management process. and a way for stores to forecast their merchandise needs at store level. All of this impacts the bottom line for the Retailer. The opportunity? 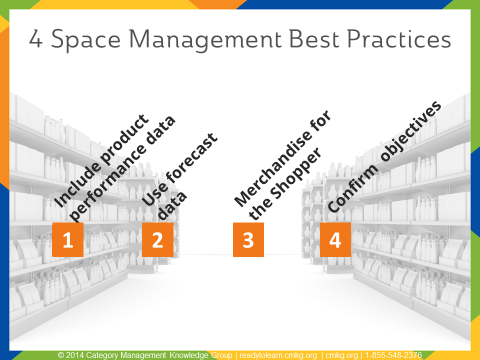 Improved understanding and decision-making of space management at a higher level in organizations, ultimately resulting in more strategic approaches to advanced space management and improved collaboration between Retailers and Manufacturers. Adding basic item-level performance data to a planogram helps you differentiate one product from another, beyond product dimensions. Performance data is non-static data that provides information about how a product sells. It can be provided at different levels of store hierarchies – obviously, if store-level data is provided, store-specific planograms can be developed. This data can be sourced from Nielsen or IRI syndicated data, shipment data, Retailer POS data, or forecast data. Shopper insight data is another performance data source that can be integrated into planograms at a more sophisticated level. This data source is normally market research focused, which provides a different perspective than other data sources. History is the easiest data source that Retailers and Manufacturers have at their fingertips on which to create planograms. However, this approach misses the fact that store performance last year will not equate to store performance this year. A best practice is to use forecast data, instead of historical data, for the upcoming time period when the planogram will be implemented. Forecast data takes into consideration the expected future behavior based on all causal factors, including seasonality, price sensitivity, and promotional events. This best practice provides a more realistic dataset from which to work. Product placement has to consider the target Shopper. You want to make products that Shoppers are most likely to buy, easy to reach and/or lift from the shelf. Use the consumer decision tree for the best layout based on how the Shopper shops the section. Also, think about your target Shopper’s needs when merchandising the shelf. For example, if you are merchandising clothing, you should keep the small clothes on the bottom racks, medium on the middle racks and large on the top racks. You should have long or tall products at the top of the planogram, and glass bottles and heavy items on the lower shelves. Focus on the Shopper also creates an opportunity (or hindrance!) 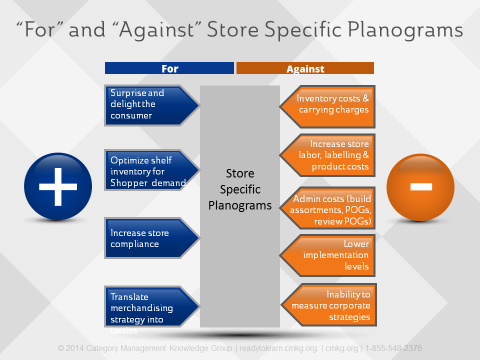 to move to store cluster and store-specific planograms. Without moving to this more sophisticated approach, you can’t possibly meet the needs of your most important Shoppers. Keep in mind, the change to a more sophisticated approach should be an evolution, starting with one planogram, moving to many planograms, then moving to localized, and then finally to store-specific. Back in my P&G days, we used to get asked to create hundreds of different iterations of planograms behind new product launches or new concepts. This required hundreds of manhours – usually with very little leadtime – to accommodate pretty much every major Retailer’s category section sizes. We spent less time behind analyzing the implications of the planogram to the Retailer’s inventory and sales, and more time on pumping out a lot of POGs, with little to poor execution of these initial planograms. your idea and get a conceptual picture of the shelf before you spend the time & resources to create the planograms required for their stores. The idea here is not to spend time on planograms BEFORE the Retailer says “yes”. NEW PRODUCT LAUNCHES: When new products are launched, Manufacturers need to show how and where they fit on the shelf. Retailers may need to do this behind private label brand launches. NEW CONCEPTS: A concept may be something like a new Shopper decision tree driven by new market research information, when a new category is being introduced, or when a new merchandising approach to a Shopper need is identified. MEET THE NEEDS OF MANY: Most Manufacturers cannot meet the planogram requirements for all of their Retailers and some Retailers cannot meet the planogramming requirements for all of their categories. In these instances, Manufacturers may allocate resources against their top Retailers, and the rest of the Retailers will get generic planograms. Retailers may allocate resources against their top categories, and less important categories may get generic planograms. These “generic” planograms don’t usually work perfectly for any stores because they only provide direction on the layout of the category and item placement. There is an opportunity to automate generic planograms to Retailer-specific assortment, which will help make them more relevant for each Retailer. Do you have overarching strategies associated with assortment and space planning for your organization? At what point in your new product launch process do you consider assortment & shelving? Do you create best-in-class gold standards for product databases, processes, category reviews, planograms, and Shopper understanding for your organization? Do you have well-defined outputs based on the importance of the Retailer or category? Do you have strategic space management training available for roles that make recommendations / decisions that affect the shelf (e.g. new product launches, UPC code changes, logistics, etc.)? improve execution of space planning at the shelf. Looking for a strategic approach to Space Management & Shelving? Category Management Knowledge Group can help you, your team or your organization learn more through a single course or a customized program. We have some great category management training options available to meet your needs. Check out our accredited course on Leveraging Data for Advanced Shelving Solutions, or watch a video preview of the course below.